Okay, this is really getting away from the horror theme of these but I figured, it's Halloween-related so that should be close enough. Plus, I didn't have the time for a super bloody movie, so this will just have to do. I can't really remember the last time that I actually saw this movie. It's been quite some time but it always pops up every Halloween because it seems to be every girl 30 and under's favorite film to watch this time of the year. I had avoided a rewatch for so long because I was always too busy with the goriest and the bloodiest movies in October. So what better movie than Hocus Pocus, a film that's had many sequel talks in recent years and seems closer than ever to being greenlit. The film itself is a really fun time. The cast is good and has a great understanding of what kind of movie this is. 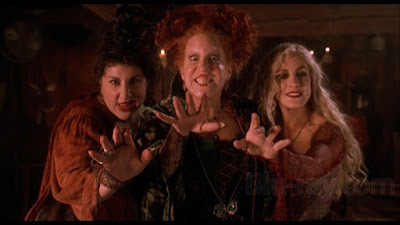 I remember being scared of the witches when I was younger, and watching now, I have no idea why. They aren't scary, nor do they try to be. Most of their lines are meant for humor yet my child mind thought they were threats, coming from witches. Oh silly me. Still, it's a nice reminder of just how easily children can be scared and while this movie seems light and friendly, its subject matter still brings some scares for kids. I may start putting this into my annual rotation.